The women left the bodies of the men to their fate. Those bodies would have just slowed them down. When they were ready, they vacated the ledge at the top of the hill and rode hard down the hill. Immediately, Melissa’s alarm went off. It was a perfect imitation of a car alarm and made all those different annoying sounds. But the orcs who decided against direct confrontation were not against hiding in the bushes and pelting the troop with arrows. Jessica happened to turn her head so the arrow just scratched across her cheek. Two elves were wounded, one in the arm where she held her shield and one in the leg just below her shield. 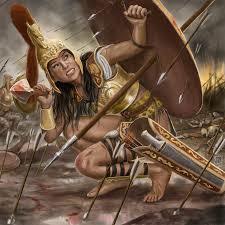 Most of the arrows fell short or hit the shields the women had pulled out against just this possibility. Emily’s horse took an arrow behind the saddle, but it did not penetrate deep and soon fell out on its own. Fortunately, the horse did not balk. It ran with the rest as hard as it could. When the women got out of range and the alarm died down, they paused only long enough to examine their wounds. The bloody one was Jessica’s cheek, but a bandage was about all they could do. The bandage would turn red, but soon stop the bleeding. The one most seriously injured was the elf with the arrow in her arm, but she broke off the shaft of the arrow and looked at her Captain with determination etched through the pain. 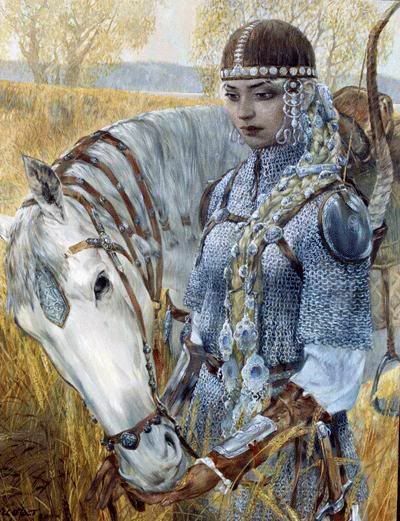 “Ride,” the elf said, and Riverbend, who was barely holding to her own horse did not argue. They rode, perhaps not all out, but at a swift pace all along that valley. Twice more they heard Melissa’s alarm, but they did not stop. They rode through and saw no more arrows. And they saw no more orcs until evening, just at sunset. The trees were already back to normal. The light was pure and untainted with the darkness. Sara and some others hoped they were out of it, but Riverbend knew better even if no one else did. Sure enough, there was a line of orcs directly in their path, and that line was three thick. The whole troop came to a halt some distance away. “No way around,” Riverbend said. The river to their right was too fast and deep, and the trees to their left would give them no chance of outrunning the enemy. Emily did not pause. “Wounded to the rear. Everyone else form up like two sides of a triangle behind me. We poke a hole to ride through. Protect the wounded.” To be sure, the line was ragged and would get more so once they started to ride, but the idea was there. Emily began to trot, Riverbend beside her. They all had fairy weave helmets since Jessica took that arrow in the face. No doubt they looked as formidable as they could be. The enemy began to shoot some arrows when they were still out of range, and there was some yelling and shoving among the orcs. 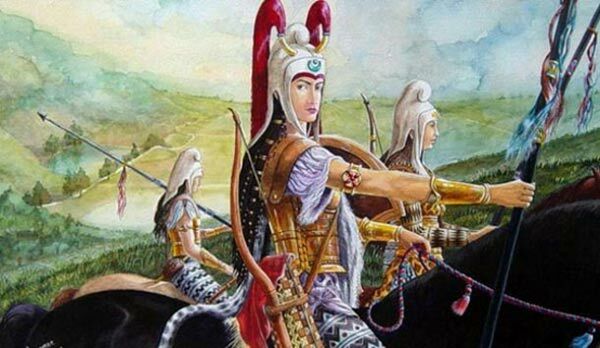 But then the women were in full charge mode, spears pointed forward like needles deadlier than any arrow. Some orcs began to back away. Then they were within range. Fifty arrows came at them all at once, followed by fifty more. Some of the first fell short and some of the second overshot their targets. But some struck hard on. Many of the arrows were stopped by helmets, shields and armor, but a few penetrated. Two horses went down, but the elf with an arrow in her leg reached down and picked up one of the elves without stopping. Mindy was a bit more difficult. Arwen had to slow considerably to bring her aboard. Then they had to catch up, but by then Emily and Riverbend reached the enemy line and the orcs scattered, or died. The hole was plenty wide when Arwen and Mindy went through last, and they were free. Two hundred yards on and they stopped. The orcs were not following them and there were wounded. Just about everyone was hurt, or had an arrow somewhere. The Kevlar proved effective, but not entirely so. Melissa had an arrow in her thigh. Maria had one in her side not unlike the one Jessica took all those ages ago in the gym. At least that was how it felt apart from the pain. Mindy likely had a concussion to match Amina’s. Jessica’s cheek was bleeding badly again, and Emily was sure her hand was broken this time. Even Sara took an arrow, in her foot, but she was more embarrassed by it than otherwise. They left two dead elves on the field, and Emily started the tears. The elves cried with them, and then Sara started the hugging. It was not long, though, before they all vanished from that place and found themselves in a courtyard of the castle where little ones of every shape and size stood ready with stretchers and elf medicine that Maria the healer and Emily the would-be nurse wished they knew how to make. Amina started to shake her head, but it hurt so she said, “No.” And it was a sad little no. Zoe left. Nurses came and changed bandages and gave pills, just like back home. Then they were told to rest, but Hilde, who had said nothing that whole time finally spoke up. “You said in Israel you would be doing the same thing,’ Greta said, seriously. Several of the women looked at Greta like she had a loose screw, but Jessica remembered she was a psychology major. She probably had several loose screws. 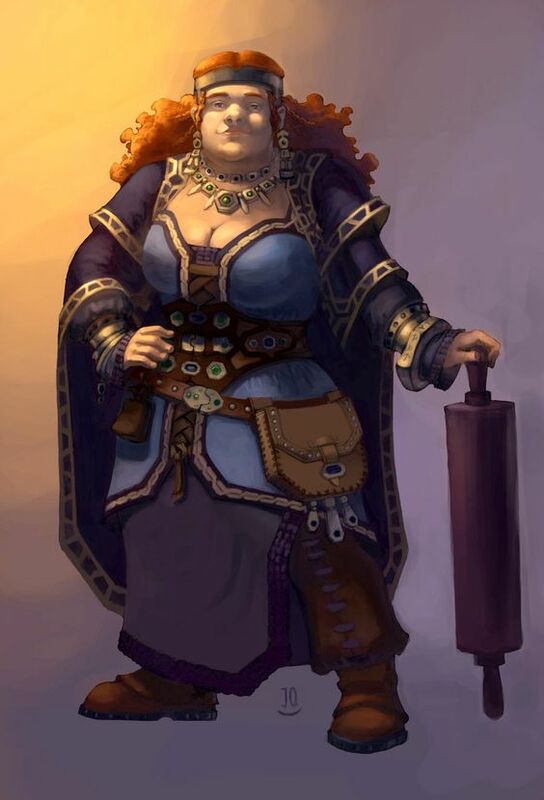 “I am not expecting Israel to be attacked by orcs anytime soon,” Hilde responded sharply. On the following Saturday the women sat around in the great hall where the dwarf lady, Ms Biggabut brought in some new treats for the buffet table and stayed to tend to what was already there. Riverbend and a few of her troop sat with them. Maria remarked that the week was far better than a trip to Florida if she did not gain a hundred pounds. She meant it as a compliment. “Better than Disneyland,” Jessica commented. “Disneyworld,” Mindy corrected the Californian. “And Six Flags put together,” Maria added. Heads were nodding in agreement when Sara came in dressed only in a bikini. Natasha was the one who verbalized the “Wow.” They had only seen the Priestess in frumpy head to toe clothing, sometimes with a minister’s collar. This was a sight, and in fact Sara was very good looking, if not beautiful. “Who would have thunk it?” Jessica said. “Are you girls going swimming today? The mermaids said they would come up the river after lunch.” Sara looked down, like she, herself, was a bit embarrassed by what little she was wearing. “Paul should see you dressed like that,” Emily said with a little impish grin that she was learning to imitate from being in such close quarters to the real thing. The women all knew that voice. It was Commander Falcon. Sara nodded and the fairy sprinkled her with some proverbial fairy dust. Sara rose up into the air and followed the fairy out of the room in flight. “Paul is going to be so jealous,” Maria decided. “She better stay away from Brinkman,” Jessica decided something else. “Robert could not handle my little bit of magic. No way he could handle all this,” Melissa sighed. “Bill would be freaking out, too,” Mindy responded. 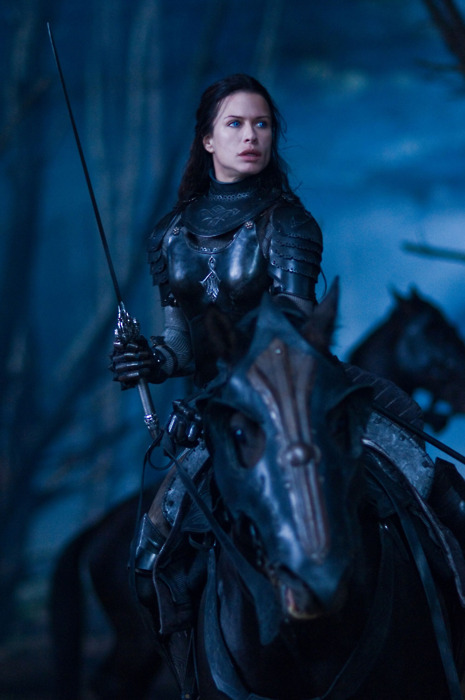 “I would like a boyfriend.” It was Arwen, the elf who spoke up. “I got mine,” Riverbend said with the biggest grin of all. They all stopped when they heard the sharp crack of Ms Biggabut’s cooking spoon on the buffet table. “Boyfriends,” the old dwarf said through her frown. “All you get with them is the three Hs, heartaches, headaches and husbands, and husbands are usually the reason for the first two.” She cracked her spoon sharply once more when Amina spoke up. “Got anyone in mind?” Jessica asked.